Over 800 azalea species exist, and of those, several hundred grow throughout Florida. The central and northern regions of the state offer the most suitable climate for azaleas, the University of Florida IFAS Extension reports. Fewer species of the flower will flourish in the southernmost areas because of the climate. You can use azaleas in any number of ways in your home garden. They make a good border plant or can be used as a backdrop in a garden. Find a location suitable for growing azaleas. In Florida, azaleas do best in a spot they gets filtered sunlight but no dense shade, the IFAS Extension reports. Make sure you have well-draining soil, because azaleas have shallow roots. Plant the azalea in your selected spot. Dig a hole 6 inches deeper and 12 inches wider than the root ball, the IFAS Extension advises. Place the plant in gently and pack in the surrounding soil so no air bubbles remain. Water the plant thoroughly immediately following planting. 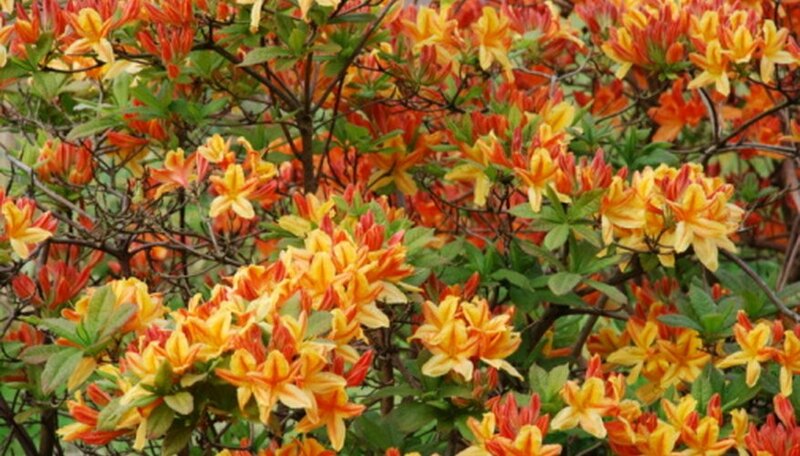 Mulch around the plant with 2 to 4 inches of mulch made from pine, wood chips or leaves, the Azalea Society of America recommends. Water the plant the day after planting and continue watering the plant at least weekly for the next several weeks. Once they become established, azaleas should be watered every 10 to 14 days to a depth of 14 inches to 18 inches, the IFAS Extension recommends. Fertilize the azalea seasonally with a 15-5-15 or 12-4-8 fertilizer. Regular fertilization is necessary because of the sandy Florida soil, the IFAS Extension reports. Prune your azalea lightly two or three times toward the beginning of the growing season, shortly after flowering.